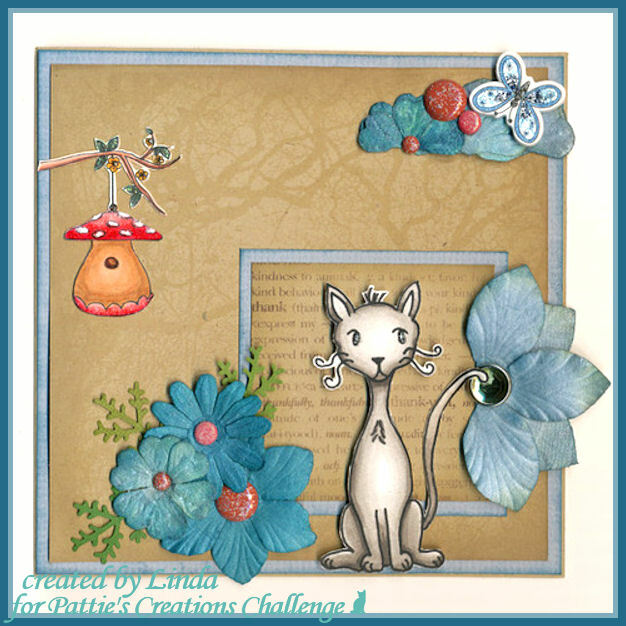 It's time for a new challenge over at Pattie's Creations Design Challenge - GLITTER or BLING - #26 - I used Brads, Glimmer Mist and Stickles/Glitz to make it GLITTER/BLING and 2 images from Pattie's Creations 'Mushroom Birdhouse' and 'Allie Sitting', colored with Copic Ciao. Stop over at her Etsy Store and browse around. There are FREEBIES too. All the flowers/butterfly are from Petaloo Color Me Crazy - One of the largest collections of coloring embellishments with the widest range of materials, shapes, sizes & textures. Paint, stamp, ink, spray, stain, color or just as is. I colored the flowers with Glimmer Mist; Frost and Moonligt and the butterfly with Distress Stickles; Tumbled , Midnight Blue, Gunmetal and used a gelpen at the edges. Great post and love the image.. love the half flower too. Thank you for entering the Petaloo’s Color me Crazy Challenge. Your entry is just lovely. We will be emailing the winners & runner-ups on Wednesday July 27th ! And don’t forget to visit our Petaloo Youtube channel and website gallery for more ideas and inspiration. Good luck! Great card. I love how you colored the cat. Thanks for joining us at Sew Many Challenges in our glitter challenge. A fabulous card indeed!!!! Love all your perfect embellishments. Thanks for joining us at Freshly Brewed Challenges. Wow, your card is so great. I love how you combined the images. TFS. This is so cute Linda! Wonderful card. I love the little scene. It's as if your little cat can't decide whether to stalk the birdhouse or go after the butterfly. Very cute! So adorable Linda! Allie looks like she's guarding the birdhouse, or getting ready to pounce on the first bird that flies by. Great job! Flot kort. Sødt og anderledes. Oh Linda, this is Super! I love how you have Allie sitting near my Mushroom Birdhouse. I LOVE IT!!! Super job on the StampinB challenge this week. Thanks for joining the StampinB challenge this week and hope you'll come back and play again next week! This is SO sweet!!! I love the birdhouse and the flowers remade into clouds.